Calling all curls. Super Rich - with the invigorating scent of lemon grass. 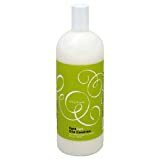 This ultra creamy instant conditioner keeps curls shiny and manageable. For maximum effectiveness use daily. Not tested on animals. Made In USA. This line of products is wonderful for curly hair. One Condition is light enough to use daily with our without shampoo. It detangles hair and leaves it smelling great! Finally won the battle over frizz!